Autotech Recruit’s MD, Gavin White, has been appointed as the National Tyre Distributors Association’s (NTDA) new Chairman for the South-East & Central South Region. 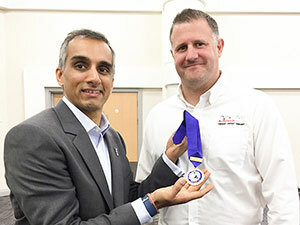 In an official handover from Prashant Chopra at the NTDA’s annual AGM, held during the recent Automechanika Show in Birmingham, Gavin was formally installed as Regional Chairman by NTDA Chief Executive Stefan Hay, who cited Gavin’s passion and tenacity to improving recruitment within the industry as pivotal reasons for his appointment. The increase in demand for skilled workforce within the automotive industry is particularly prevalent in the South-East and Central South region, therefore South East based Gavin was the ideal candidate for this prestigious position. Founded in 1930, the NTDA is a strongly proactive trade association representing and promoting the interests of the tyre wholesale, distribution and retail sectors of the automotive aftermarket industry.